Charles Howard, Third Earl of Carlisle. As the planner of the Castle Howard landscape, he holds an important place in the history of English garden design. Howard was first Lord of the Treasury (1701-6) and an occasional poet. 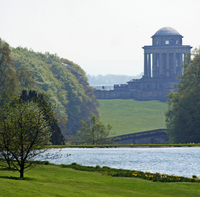 His interest in the classical world led him to the Augustan style of the Castle Howard landscape.